The Thirteenth Edition of Educational Psychology continues to emphasize the educational implications and applications of research on child development, cognitive science, learning, motivation, teaching, and assessment. Theory and practice are considered together, showing how information and ideas drawn from research in educational psychology can be applied to solve the everyday problems of teaching. The text reflects the field as it offers unique and crucial knowledge to any who dare to teach, and to all who love to learn. The Enhanced Pearson eText features embedded video, assessments, author-created AnitaTalks podcasts, teacher certification exam prep, and video analysis exercises. Educational Psychology is also available with MyEducationLab, either standalone or packaged with a loose-leaf version. Anita Woolfolk Hoy was born in Fort Worth, Texas, where her mother taught child development at TCU and her father was an early worker in the computer industry. She is a Texas Longhorn—all her degrees are from the University of Texas, Austin, the last one a Ph.D. After graduating, she was a psychologist working with children in elementary and secondary schools in 15 counties of central Texas. She began her career in higher education as a professor of educational psychology at Rutgers University, and then moved to The Ohio State University in 1994. Today she is Professor Emerita at Ohio State. 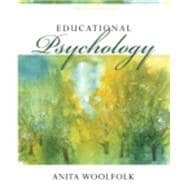 Anita’s research focuses on motivation and cognition, specifically students’ and teachers’ sense of efficacy and teachers’ beliefs about education. For many years she was the editor of Theory Into Practice, a journal that brings the best ideas from research to practicing educators. With students and colleagues, she has published over 80 books, book chapters, and research articles. Anita has served as Vice-President for Division K (Teaching & Teacher Education) of the American Educational Research Association and President of Division 15 (Educational Psychology) of the American Psychological Association. Just before completing this 13th edition of Educational Psychology, she collaborated with Nancy Perry, University of British Columbia, to write the second edition of Child Development (Pearson, 2015), a book for all those who work with and love children. Her next project is the 5th edition of Instructional Leadership: A Research-Based Guide to Learning in School (Pearson), written with her husband, Wayne K. Hoy, the Novice Fawcett Chair of Educational Administration at The Ohio State University.